Nestled on Long Island's North Fork, you'll discover the most perfect place for you to hold your wedding. The sophisticated, yet classically beautiful Vineyard Caterers. Here, we honor your special day by devoting our whole facility to your wedding and your wedding alone. Our management and staff are totally focused on making it as memorable as possible for you and your invited guests. Surrounded by spectacular scenery, our one-of-a-kind catering facility is crowned by the stunning natural beauty of our own private, 50-acre vineyard. This rare setting enhances your special day in an almost magical way that simply can't be duplicated. My tea parties have gained more sheen thanks to Vineyard Caterers. They make sure I get what I ask for and their services are good always. Thanks for all the help and professionalism always. Do not assume that Vineyard Caterers only look after the wining needs at your function! There are cheese cakes, choc shakes, and many other services for you to enjoy! You only have to discuss your custom menu with them and they make sure you have everything you need. I recently ordered some food from them for a small family get together and everything was perfect. Now, I’m considering about hiring them for a party. Lets see how things progress from there. All I can say is that – these guys are the bestest of the best! My parents have been married to one another for sixty (60) years, and my brother and I wanted to do something really special for them to celebrate. We choose to use Vineyard Caterers. The banquet hall was stunning, and it didn't even begin to compare with the view outside. The food was absolutely wonderful, and the staff was really on their toes. They were not only quick, but friendly and professional. The evening went over without a glitch, and my parents got to celebrate their long life together among their family and friends. This is simply one of the best facilities on Long Island. I am so happy that I chose this location as the place of my wedding. Everything was perfect, from the stunning decorations to the friendly professionals who seemed just as interested in making my wedding memorable as I was. In addition to providing an amazing location to host my wedding, they catered a fabulous meal that was enjoyed by all. There was plenty of fresh, hot food, all of it looking as great as it tasted. I could not be any happier with the money that I spend to use Vineyard Caterers. What a gorgeous place this is with a marble fireplace, an indoor balcony and so much posh charm! 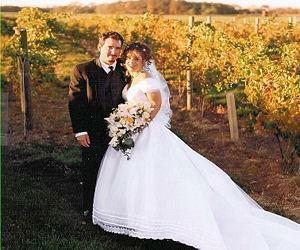 The grounds are just as amazing as the banquet halls, set on 50 acres of authentic Long Island vineyard. This was an elegant and beautiful place for our wedding reception, one which encapsulates the dreams we have for our future (we'd love to have our own vineyard someday). I highly recommend it if you're tying the knot or holding any other kind of special celebration. My grandmother turned ninety last year, and we wanted to do a big surprise birthday event with all of the family we could reach to come down. After looking around online and reading reviews, I ended up going with Vineyard Caterers. They really did a nice job with the service. The food was great, the staff was quick, responsive and professional. I have a big family, so we all ate a lot, but I don’t think I ever once saw any of the food trays near empty, they kept them filled so well. Would definitely use them again for any event. Do you have any experience using Vineyard Caterers? If so, please rate your experience and let others hear about it using the form below.